This month's challenge for the Creative Cooking Crew is to make an unusual taco, one that hasn't been done before. 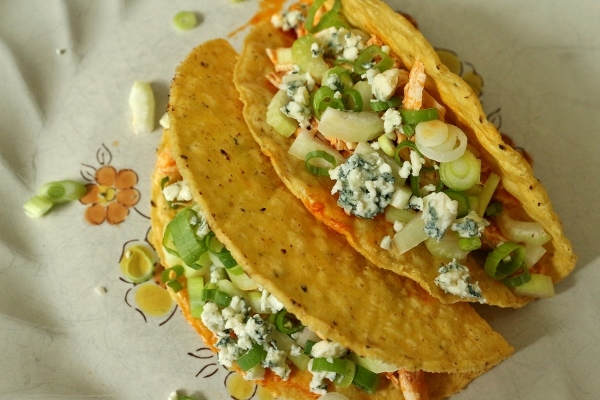 Well, I can't say that Buffalo chicken tacos have never been done before, but they are definitely not your typical tacos and since I'm a Buffalo chicken aficionado I decided to go that route for my taco challenge dish. I like tacos of all kinds, from the typical Tex Mex version to those with fish or shrimp filling, steak, and even breakfast tacos (in fact those are some of my favorites!). 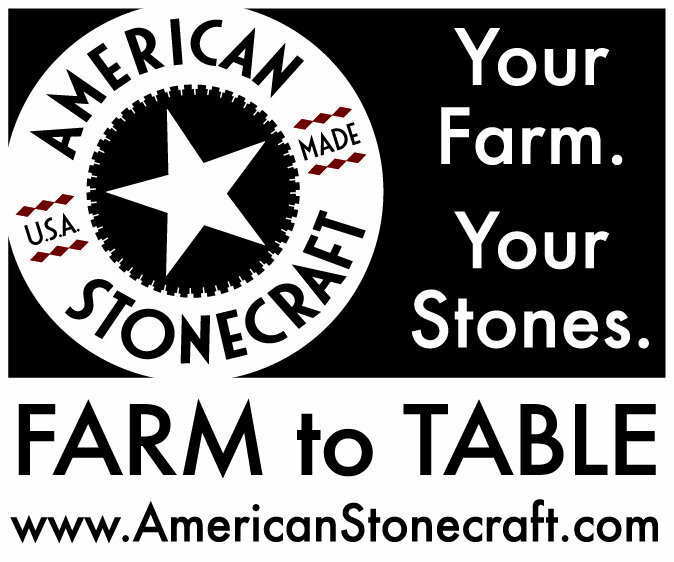 If I had to pick a favorite wrapper, I would pick homemade corn tortillas because they blow away the competition, but warm flour tortillas have their place as well, as do crunchy shells. It really depends on my mood. My family seems to prefer taco shells, and especially with the Buffalo chicken filling I figured making the tacos in these shells would remind me of Buffalo chicken nachos. 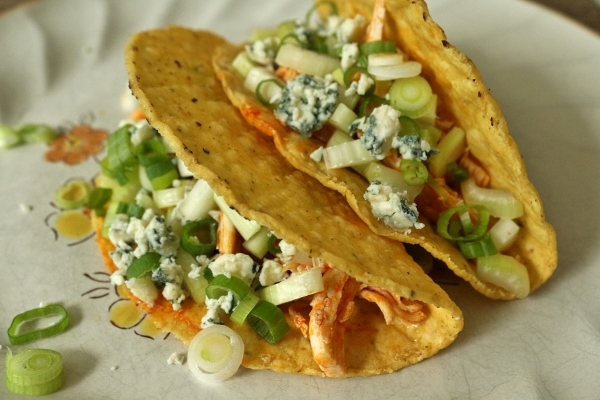 These tacos are super easy to make (you could even use store-bought shredded rotisserie chicken meat) and can be served with either crumbled blue cheese or blue cheese dressing. 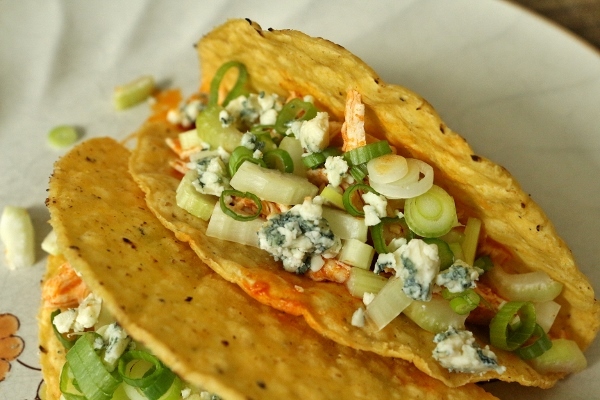 The sliced celery and scallions add both color and crunch. In my particular case, I heated the chicken a bit too long in the sauce, and the sauce broke and got a bit watery, but the flavor of the chicken was still great. Definitely beware to heat the chicken just long enough in the sauce to heat it through but not longer in order to keep in the integrity of the sauce. Regardless, these tacos are spicy (without blowing your top off), delicious, and an awesome crowd-pleaser for any fans of Buffalo chicken. 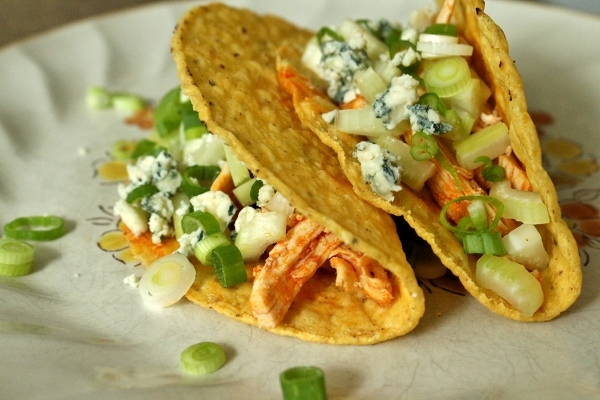 Check out the roundup of fun taco recipes on Lazaro Cooks on July 29th! In a large saucepan over medium heat, stir together the hot sauce and butter until the butter melts and emulsifies into the hot sauce. Add the shredded chicken and stir to coat. Heat it in the sauce for a few minutes, stirring constantly, until the chicken is heated through. If you heat it for too long, the sauce will break and get watery, but the chicken will still taste perfect. Just make sure to drain off most of the broken sauce when you serve or it will all drip out of your tacos (before it breaks, it is thicker and less messy). 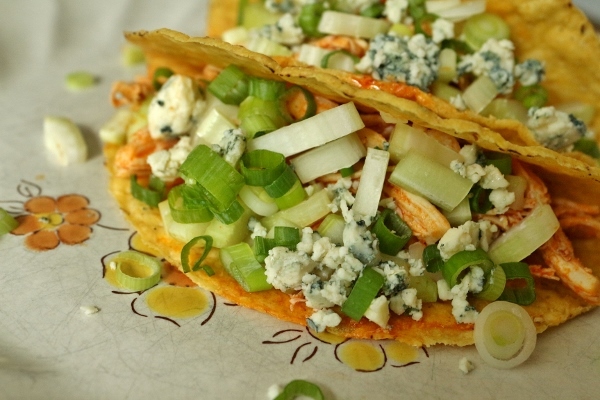 Serve the shredded Buffalo chicken filling with taco shells or tortillas, sliced celery, scallions, and either crumbled blue cheese or blue cheese dressing to assemble tacos as desired.